A Family Resort Giveaway for San Juan Island! This may be my best giveaway yet! When a friend or family member says they want to get away and escape the everyday – but not take a flight necessarily, or head abroad – I recommend Roche Harbor Resort. The resort is a gem set amongst the San Juan Islands, about 30 minutes from Friday Harbor, on San Juan Island. Take a ferry (or a floatplane, if you must) and you’re far away from school, work or other worries. Cascadia Kids is hosting a giveaway for a two-night stay at Roche Harbor Resort. You and your family will enjoy staying at one of the property’s 800 sq. ft. Historic Company Town Cottages – near the pool and playground. 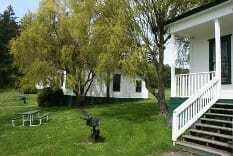 These cottages go for between $199-339 a night, and are worth every penny. You get a two-bedroom cottage all to yourself (and the kids), along with a fully equipped kitchen for cooking your farm-fresh purchases. A BBQ and picnic table offers outdoor dining as well. While at Roche Harbor, you can enjoy the resort’s family activities, like a scavenger hunt (with an ice-cream prize), a historic walking tour, hiking or whale watching. I can certainly vouch for the Roche Harbor doughnuts served up at Lime Kiln Café as a total kid-pleaser. As I wrote in my book, Northwest Kid Trips: Portland, Seattle, Victoria, Vancouver , I love the resort’s grand historic feel (the signature “Hotel De Haro” was constructed back in 1886 as part of a company town) and waterside setting. But there’s also plenty of modernity to be found – just visit the 19-acre sculpture park. If you win the prize, you can reach Roche Harbor by taking a Washington State Ferry, the Clipper (passenger ferry to Friday Harbor; May-Sept only, includes whale-watching) or by Kenmore Air’s seaplane. Transportation is not included in this giveaway; the ferry is the cheapest option. To Enter: Leave a comment on this blog, below, describing what you’d like to do on San Juan Island with your kids. Bonus Entry: Tweet “San Juan Island giveaway to @rocheharbor on @cascadiakids. #Contest” PLEASE RETURN and post a note that you’ve tweeted, in case I somehow miss your Twitter entry. Extra Bonus Entry: Sign up for the Cascadiakids.com e-mail newsletter. PLEASE RETURN and post a note that you’ve subscribed, in case I miss your new subscription entry. Want another chance at winning an incredible prize? Check out Passports with Purpose. PWP raises money for a good cause (tax deductible!) while giving away amazing prizes (like a hotel stays in the Caribbean!). This contest begins today, December 8, 2010, and ends at 11:59 pm Pacific Standard Time on Tuesday, December 15, 2010. On or about December 16, 2010, the winner will be selected at random from all eligible entries received on this page’s comments, using Random.org. The winner will be notified by e-mail on or around December 16. Please ensure that you have entered the correct e-mail address in your entry. Your e-mail will not be sold or displayed. If no response is received from the first-drawn winner within one week (7 days), the first winner will forfeit the prize and another entrant will be selected at random using Random.org. 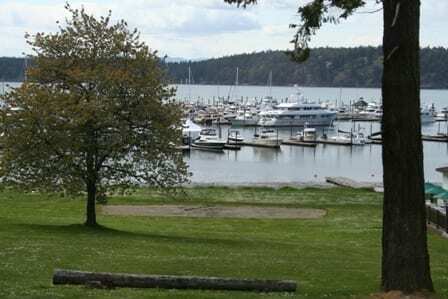 The value of the two-night hotel stay is ( $850.00) and the Roche Harbor Resort has provided a gift certificate for the giveaway. The prize is valid for a two-night stay in a Company Town Cottage at Roche Harbor Resort. 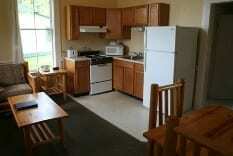 The room must be redeemed by December 30, 2011, but is not valid in July, August and certain high-occupancy weekends. Other restrictions may apply. Please reserve your room as soon as possible. The prize information must be presented when making reservations. There is no cash value. There are no substitutions. The prize is not transferable. Guests are responsible for transportation to San Juan Island. The winner is solely responsible for any national, state, provincial or city taxes incurred. Sweepstakes void where prohibited by law. Entrants must be age 18 and over and residing in the U.S or Canada. If a resident of Canada is selected as a winner, they will be required to correctly answer, without assistance of any kind, whether mechanical or otherwise, a timed, mathematical skill-testing question (3*6)+(12/2)-8 to be administered by Lora Shinn by e-mail before the awarding of the prize. By participating in the “Roche Harbor Resort” giveaway, you release and agree to hold harmless CascadiaKids.com subsidiaries, affiliates, directors, (collectively, the “Released Parties”) from any liability whatsoever for any claims, costs, injuries, losses, or damages of any kind arising out of or in connection with the getaway or acceptance, possession, or use of any prize (including, without limitation, claims, costs, injuries and losses related to personal injuries, death, damage to or destruction of property, rights of publicity or privacy, whether intentional or unintentional), whether under a theory of contract, tort (including negligence), warranty or other theory. CascadiaKids.com or the administrator is not liable for technical error, omissions or Internet inaccessibility. I did not accept money, services or gratuities in exchange for this giveaway. I requested the giveaway prize, because I like the hotel and think it’s a good match for CascadiaKids readers. One of my favorite ways to reach Victoria, B.C. from Seattle, Wash., is via Victoria Clipper. The Clipper’s three ships are passenger-only, but each one cruises from downtown Seattle’s piers directly into Victoria’s Inner Harbour. And vice versa, for Seattle-bound Vancouver-Island residents. No cars, no headaches, no hassles! While the Clipper’s fares can be spendy in summer, prices tend to go down in winter and spring (as low as $50/per person). Kids are often free, year-round. Combining Clipper and hotel via the online packages can save families between 10-30%. Check in at least an hour early as requested, perhaps even 15 minutes before official check-in. If you’re traveling with kids in strollers, request pre-boarding. Pre-boarding helps you find the family-friendly seats on the Victoria Clipper. You’ll need to break down your stroller for storage once on the Victoria Clipper. So make sure your stroller breaks down easily (one-handed, if possible!). Pre-boarding families can (and should) look for four- or six-seat clusters around tables, which makes both feeding and play easier to pull off. Bring toys that are easily contained and won’t spill all over the ship. It’s generally a pretty smooth ride, but the Strait of Juan de Fuca can get a little rough in bad weather. Staff will generally let you know in advance. If you or the kids are prone to seasickness (my son often yaks, no matter the transportation option), prepare beforehand. I bring quease-easing lollipops and try to sit toward the front of the Victoria Clipper, looking forward. Or sit near the bathrooms (rear of ship) for quick visits. Breakfast and meal packs are offered aboard the Clipper. I like to pack my own easy-to-eat breakfasts: sandwiches, juices, fruit. Remember that you’ll need to toss leftover-and-now-contraband fruits and veggies before disembarking in Victoria. Tip: The Clipper Cocoa is a enormous whipped-cream-smothered delight. It’s best right before arrival, unless the kids can handle their caffeine. At the front of some Clipper vessels, the crew shows kid-friendly films during the voyage. Ask at check-in if your ship will show a movie. If yes, sit near the front of the ship, where the movie plays on small, floor-level screens. You can get up and walk around during the journey. However, it’s not a good idea to let kids run, play or get too rowdy. The ship can tilt suddenly, catching kids off-balance, and aisle traffic can annoy other passengers. On-board or during booking, the Clipper offers extras, including tea at the Empress, Butchart Gardens admissions, and other Victoria must-dos. Check beforehand whether their prices save you money by looking up the direct-buy option from the attraction; depending upon the exchange rate, you may save a few dollars by booking through the Clipper. 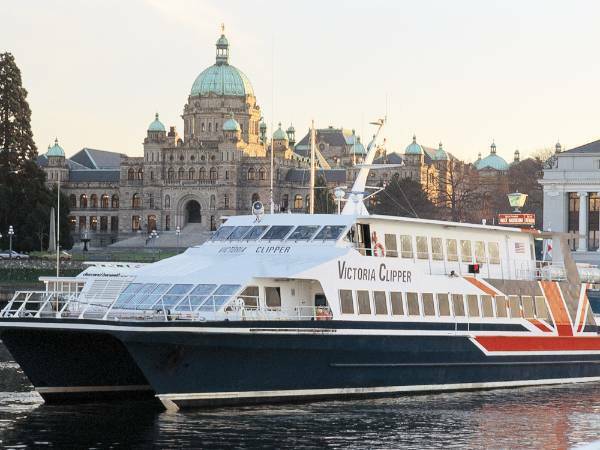 Do you have any tips for riding the Victoria Clipper?